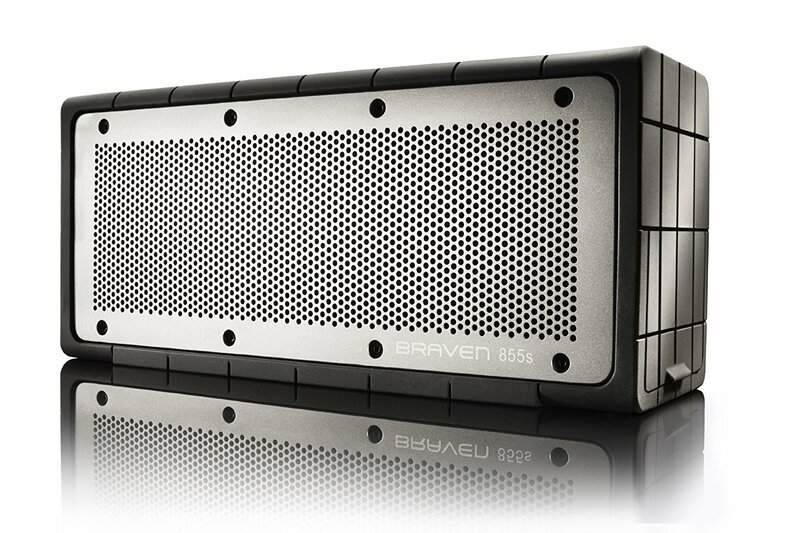 The Braven 855s is a premium Bluetooth speaker in Bravens collection. The Braven 855s is essentially the same as its sibling the Braven 850 and separates itself by boasting an even tougher exterior shell to survive the harshest conditions. Just by looking at the Braven 855s you can tell right away that its firm rugged appearance can withstand more than just a day at the beach. Covered in a thick shock absorbent polymer rubber which also doesnt seem to show fingerprints and protected with a pretty thick metal front grille it can definitely take a beating. Now with saying that we wouldnt drop the speaker from the 10th floor or submerge it in a lake but with in reason the speaker is very durable. The Braven 855s is IPX3 certified which means it can take some splashes from water. The Braven 855s maintains a very sophisticated look while providing excellent durability. Dimension wise the Braven 855s is 10 inches long and 4 inches wide and weighing in at 3 pounds makes the Braven still very portable thanks to its slender shape. On the top you will find the main controls which are engraved into the thick rubber and consist of the power button, phone answer button, play/pause button and your volume controls in that order. On the right side of the speaker covered with a rubberized shield you will find a 3.5mm aux input, power port, a USB input and 5 LEDs beside a battery button which if pushed will show you how much battery is left and each LED being equivalent to 20% battery life.The Braven 855s has a huge 8,800 mAh that lasts for a solid 20 hours of play and you can recharge your smart devices with the USB port. Exterior wise the Braven 855s is very different from the Braven 850 but as far as internals go its the same which is a very good thing because the sound quality is excellent. Just like the Braven 850 the Braven 855s pumps out a whopping 20 watts of power thanks to its extended range aluminum cone drivers and dual passive bass radiators. The Braven 855s truly sounds like a powerhouse of a portable speaker. This speaker is definitely more than powerful enough to echo throughout a medium even a large room. The SRS WOW HD technology definitely has a good impact sound wise especially in larger rooms and we recommend leaving it on all the time as it has a more pleasant sounding experience with deeper bass and punchier acoustics. The Midrange is is strong and powerful and not overly punchy. we think the bass is excellent considering we are still talking about a mid size portable speaker. The highs are very clear and crisp and we believe the SRS definitely plays a roll in all this. The true wireless feature gives you the ability to pair up two Braven 855s speakers together for a true stereo sound experience. This is a handy feature to have especially if you have a his and hers Braven 855s that you can connect together when you come home or if you meet up with friends. The Braven 855s is an excellent Bluetooth speaker that works exceptionally well indoor and outdoor. The speaker offers many goodies like a 20 hour battery life, really great sound, many features and the ability to withstand some harsh environments so if those are the features you are looking for in a portable Bluetooth speaker the Braven 855s should be high on your list. 9.5 in. x 2.75 in. x 4 in. The Braven 855s is a bit overpriced, but it’s built like a brick, delivers decent sound and has strong battery life.